Kevin Crossley-Holland needs no introduction. He is a poet, translator of Anglo-Saxon, a librettist and a reteller of myth, legend and folk-tale, and more recently an acclaimed historical novelist for children, winner of the Carenegie Medal for Storm and the acclaimed Arthur trilogy, which has sold one million copies worldwide and been translated into twenty four languages.The first volume, The Seeing Stone, won the Guardian Fiction Prize. More recently Kevin has published Gatty's Tale, the story of the irrepressible farm girl from the same trilogy, and two books set in the age of the Vikings and the often perilous adventures of Solveig, who goes in search of her father in Bracelet of Bones and Scramasax. In 2009 Kevin published The Hidden Roads, a beautifully evocative meditation on land, family and a childhood wrapped around discoveries of many kinds. 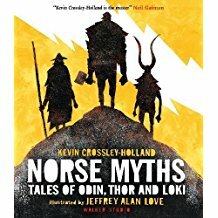 But it is a translator and reteller that Kevin first made his mark and he has recently come full circle with a whole new treatment of the Norse Myths, in Walker Books Norse Myths Tales of Odin, Thor and Loki, with powerful and visceral illustrations by Jeffrey Alan Love. I've known Kevin for over ten years now and our meetings and friendship have grown almost entirely out of a series of fascinating courses at Ty Newydd Writers Centre on the Lleyn Peninsula in Wales, concerning the retelling of myth and folk-tale from the source material. In the first two of these courses in 2007 and 2009, Kevin was partnered with Malachy Doyle, where mostly folk-tales were explored. More recently, Catherine Fisher joined him to co-tutor courses in 2014 and October of last year where both Welsh and Norse myth were extensively and excitingly explored in the tales of Perceval, Branwen and Balder. Kevin, first of all thank you so much for agreeing to talk to the readers of awfully big blog adventure. 1. As I mentioned in my introduction, I’ve been on several of the courses you co-tutored with Malachy Doyle and latterly Catherine Fisher, at Ty Newydd on the Lleyn Peninsula. On the first in 2007, you began your first session by reading from and further exploring a talk you gave in 1997 as part of the Wandsworth Arts Festival and National Libraries Week. The title of that talk was ‘Different – But Oh How Like, itself a reinterpretation of Wordsworth’s ‘Yes, it was the Mountain Echo’. As this was our starting point for a whole series of courses, which practically explored the updating or reinterpretation of traditional tales, could you introduce us to the basic premise of that talk. The longer I engage with traditional tale, mainly as a reteller but from time to time as a storyteller, the more I've understood the differences and likenesses between the two disciplines, and how much each can learn from the other. I looked over my shoulder at accounts by folklorists of great storytellers in action, and tried to identify the intentions of storyteller and reteller and to describe their responsibilities. . . This may all sound rather clinical, but actually that talk was a way of finding out for myself  just as all good imaginative writing is. 2. Now this series of interviews are on the subject of the King Arthur stories, or as they’re sometimes known. ‘The Matter of Britain.’ In the first I talked to John Mathews about his new book, The Sword of Ice and Fire, the first in a series about young Arthur, and how what he is doing is giving us a highly different version of the young Arthur. I know you kindly provided a testimonial for the book, so I’d like to ask you just how different an interpretation of Arthur do we find in John’s book? I admire John Matthews and his work, but may I offer you an opinion about the series when he's written it? He's certainly off to a great start. 3. So let’s take you back to you boyhood, Kevin, something you write about so beautifully and evocatively in your memoir ‘The Hidden Roads.’ Was there a King Arthur moment and if so, how and when did it happen and did it have a lasting effect? I've been thinking and I can't say there really was a single moment. But my father regularly said-and-sang traditional tales to my sister and me, accompanying himself on his Welsh harp, so of course I was familiar with motifs that occur in Arthurian legend (walking on water, for instance, or achieving magical feats, or sleeping through centuries) and with some of the legends themselves. 4. John Matthews once told me that it was difficult to interest publishers in the idea of a young Arthur because so many of them just say, ‘well, Kevin Crossley Holland has already done that.’ But of course in so many ways your own King Arthur is much more a secondary character in a wider narrative concerning your own Arthur. When you decided to show the King Arthur through the looking glass of The Seeing Stone, was it in your mind to write about Arthur de Caldicot first, or did you come to King Arthur first? How did the idea come about? My longtime friend and publisher, Judith Elliott, commissioned me to write a 'straightforward' retelling of the best known Arthurian stories, largely based on Malory. But the nearer I edged up to the starting-line, the more doubts I had. Without ignition and excitement, duty can carry you so far, but not far enough! I was well aware of earlier versions of Arthur and they seemed to stand in the way. I was also aware that I'd already spent much of Orion's substantial advance against royalties. Crisis! What I knew was that I wanted to make King Arthur new to me, and in me, and my solution came all of a sudden, while staring at the obsidian paperweight on my desk: to write a kind of antiphon, with the stories of King Arthur and Arthur de Caldicot in part mirroring each other. So, Steve, King Arthur came first. 5. What do you think your young Arthur learns through ‘seeing’ the tales of the other Arthur in this way, what lessons that he can take into his own life? Arthur de Caldicot learns lessons that apply to almost every aspect of his life, and as he often reviews them himself, I won't rehearse them here. But he also learns something by no means always present in the Arthurian legends, and that is to refuse the hand-me-down and ask questions for and of himself. He's growing up, he is learning from new experiences day-in, day-out. Thus his appalling firsthand experience of the actuality of hand-to-hand fighting in King of the Middle March, its sheer brutality, leads him to reject the glorification of war and the warlike inherent to the legends. 6. And of course for long enough he also has Gatty, the farm girl by his side, a character so popular and endearing, that in the end you had to give her her own book. How did Gatty’s tale come about? I fell in love with her from the first. Salt-of-the-earth, enduring, robust, merry and even witty, very decided but by no means unwilling to learn, outspoken, tender. So when my Norwegian publisher suggested that I might like to keep her company for a while longer, I agreed! 7. In the end your own young Arthur is involved in a real war, isn’t he, a far cry from those of the historical and mythical Arthur. In the battle scenes in the final book, what impresses me so much, as it did in the first two books in the trilogy, is your exquisite use of detail, which truly conjures up those times in picture, sight, sound, feel and smell, as well as all those lists. Do you have a love of lists, Kevin? 8. Now of course both the mythical King Arthur in all the interpretations has a Merlin by his side, as does your Arthur. And T.H. White, most memorably, also has Merlin to guide young Wart. Speaking as someone who can hardly prevent Merlin from butting into everything I write, do you think an Arthur has to have a Merlin? I know my Arthurs had to have their Merlin, not only as a go-between the worlds but also as the broker between innocence and experience. As they try to interpret the worlds they live in, he is their chief guide. But there are, aren't there, other ways in which one may learn: from the accumulated wisdom of those 'who before us weren', from the patterns of the natural world, and so on. While I cannot separate my own sense of Arthur from Merlin, I find very appealing the idea that he could be a complete loner, who has to make his own way. 9. So you’ve fallen in love with the Arthurian characters at some stage and much later you decide to reinterpret in this unique way. In between those times what things that you read or saw inspired you the most? You're asking me to review fifty years and more of my life! 10. The Matter of Britain is only one strand of the storytelling which originates in these isles. Apart from my particular passion for Welsh Myth, there are the Irish tales and cycles like the Book of Invasions and then of course the Norse Stories which started it all for you. Do you see any connections between the Norse and Arthurian tales, anything you might be keen to further explore. 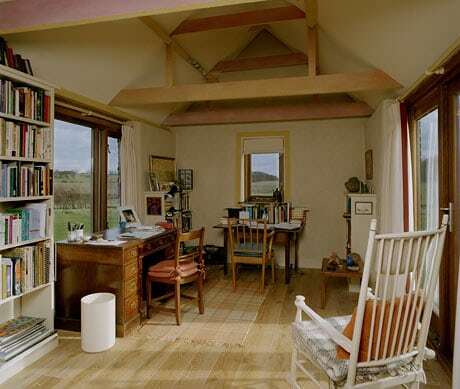 Every writer needs a space to write in. 11. Kevin, you're widely known as a translator and re-interpreter of Norse myth, as well as an acclaimed poet and writer for children. Can you tell us how all that came about, because as I just said, I know this was really the start of your journey. Weren’t you also given some early advice by a famous poet. I owe my father a great debt: for grounding me in traditional tale, and for close reading of my poems and stories not only when I started to write but through my twenties and thirties. I've already documented elsewhere my unpromising beginning  failing 11-plus, securing only 3 'O' Levels, and 1 'A' Level and on top of that failing my Anglo-Saxon prelims. at Oxford (I'd sneaked in through the back door, as a tennis-playing ordinand!). Only during my early twenties did I begin to pick up some speed, furthered in this by my first job, working in the publicity department at the publishing House of Macmillan. Several times during my twenties and thirties, I met the great poet W.H. Auden, and he counselled me to 'Look north'. I did so, literally. I threw up my job as editorial director of Victor Gollancz, took my two sons to Iceland, and embarked on the Norse Myths. 12. And at the moment the Norse myths are very much back at the top of your agenda with the publication at the end of last year of your new collection for children. I remember you telling us just before that that you consciously went back to your earlier collection in the Penguin Myths series and re-interpreted them. Was there any particular way in which you did that? Well, it's true that the Norse myths have been at the top of my agenda, but it's also true that they've been at the top of our agenda. Films, TV series, conferences, comics, re-enactments and the like. In revisiting the myths after more than thirty years, I saw more clearly how human the gods are in their repertoire of thoughts, feelings and actions; I saw how uninterested in human beings they are; and I saw how much in tune with our own thinking the myths are in being so finite, so apocalyptic. All this certainly had a bearing on my new retellings, as did the fact that writing for children carries certain responsibilities. 13. Finally, Kevin, you clearly still have writing projects to dream up, not to say complete. Can you give us any hints on plans for the future? cf. See question 10. Here's a quotation instead! Pillar of dust kindled by the sun. Shaft quicksilvered by the swimming moon. the grace to make light of my understanding. Thank you so much, Kevin for answering all my questions for our readers. Thank you, Steve. I've enjoyed it. Author of The Seven and co-writer and story editor of Fragon. Steve, thank you for bringing this very fine interview to everyone on ABBA, and also for letting us hear Kevin Crossley-Holland's thoughts about Arthur and colder Northern tales on this hottest day of the year.